It's time to drive sales and heighten on-site marketing capabilities. Boost customer loyalty programs and influence buyer behavior by targeting the right customer, at the right time. Discover how Broadleaf enables marketing teams to increase conversion rates and customer retention through custom on-site campaigns. Whether you like your BOGOs stacked, your URLs custom, or your shipping free - get ready to launch sales in a flash. Broadleaf maintains the industry's most powerful, rules-based offers and promotions engine for targeted marketing efforts. From banner ads to site-wide discounts to bundled and referral offers, Broadleaf's robust admin enables teams to easily create any offer within just a few clicks. Value your customers? Construct a high-caliber customer service experience with targeted offers and promotions for your loyal site users. 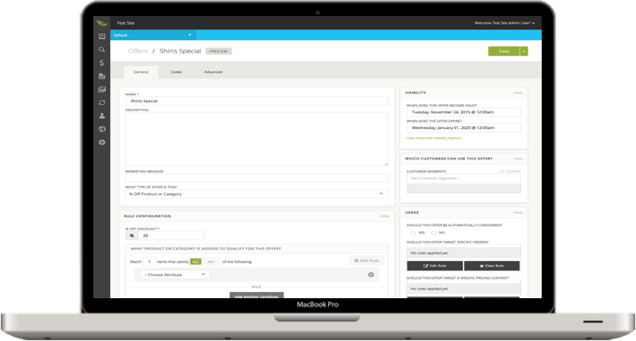 Easily customizable and extensible, Broadleaf allows you to stack and combine offers, create custom fields, and deliver downloadable custom offer codes.